Besides boosting Buick's image, the Regal GS gives dealers a car that could appeal to orphaned Pontiac customers. DETROIT -- A high-performance version of the Regal sedan will reach showrooms in the second half of 2011, Buick says. 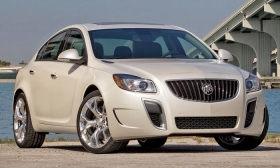 The Regal GS is designed to improve Buick's image with younger customers and give the brand performance credentials. It also will give Buick dealers a car designed to appeal to many orphaned Pontiac customers. The 2012 Regal GS will be powered by a 2.0-liter turbocharged engine teamed with a six-speed manual transmission. The sedan will deliver 255 hp and travel from 0 to 60 mph in less than seven seconds, Buick says. Drivers can customize suspension settings and steering sensitivity with three modes: standard, sport and GS. Prices have not been announced. "Built on the performance foundation of the Regal, the Regal GS was designed as an even sportier expression of responsive performance and style," Buick's marketing vice president, John Schwegman, said in a statement last week. Last month Buick announced that the Verano compact also is coming in the second half of 2011, another effort to broaden Buick's appeal.